Thanks to the summer floods and township/state policy, Bill Metz is up a creek without a shovel. “I don’t have anything to smile about,” was Metz’s wry reply. © 2012 by The York Daily Record/Sunday News. 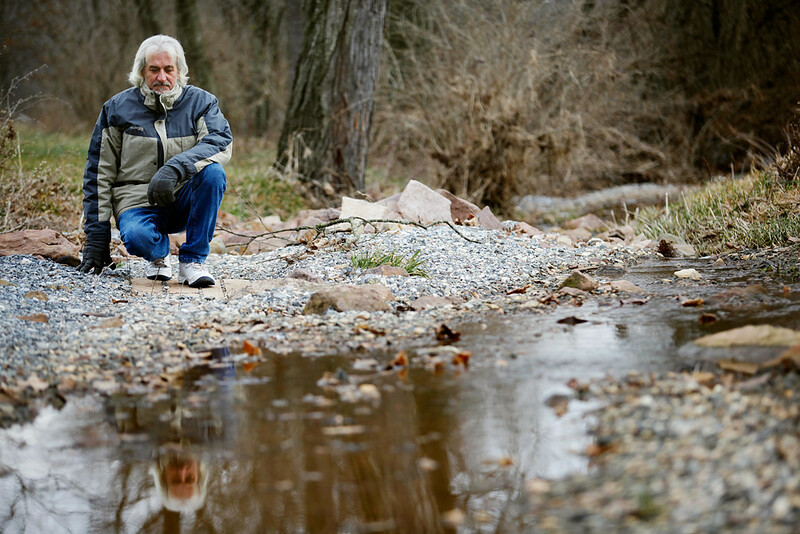 Bill Metz has lived in Conewago Township off Mill Creek Road since 2000 on a property bounded by a runoff stream from a closed quarry. The stream, which runs through a pipe under Mill Creek Road, flooded twice last summer, washed out the banks and deposited gravel about 2 feet deep onto the streambed. Because there is no longer a deep gully, rainwater rises quickly on his property now and threatens the corral where his horse lives. Conewago Township officials have refused to help Metz clean up the stream, and he is unable to clean it up on his own without getting a permit from the state department of environmental protection.